As an aerospace company that specializes in the machining of complex CNC parts, things at Evaero can often become stressful. I have found that, although we all get used to stress at certain levels, it’s important to take a break to gain some perspective. There is no better way to do that than by traveling. Given the favorable exchange rate between the dollar and the euro, now is a great time to visit Europe. One of my favorite European cities is Strasbourg and today, I’d like to introduce you, if you are not familiar. 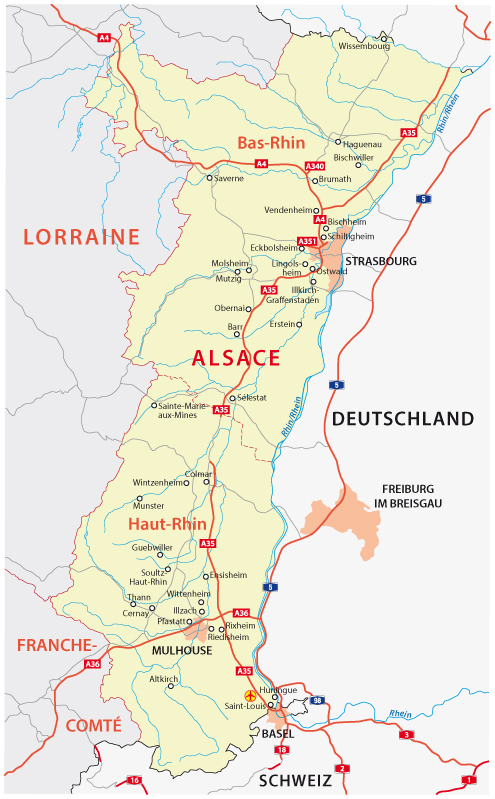 If in the rest of France the church is seen as an obstacle to the formation of the republican state here the church is seen as a part of the regional identity of Alsace and a protection against the Germans. Use AirBNB for your lodging. Use a midsize city with easy access to open space (e.g., parks) as your home base. Use a car to take day trips. Not much needs to be said about the first item on the list other than you should feel comfortable knowing AirBNB is heavily used in Europe and especially so in France. Last summer for example over 517,000 people stayed in one of AirBNB’s 40,000 listings (!) in Paris, easily making it their largest market. Obviously, there are not as many choices in Strasbourg (thank goodness!) but there are still plenty to choose from. We prefer AirBNB to a hotel because you live amongst the residents of the city rather than other tourists. However, even if you’re more comfortable staying in a hotel you’ll find the prices to be much more reasonable than in a larger city like Paris. A mid sized city with just under 300,000 people, Strasbourg has much open space for you and your kids to stretch your legs out. 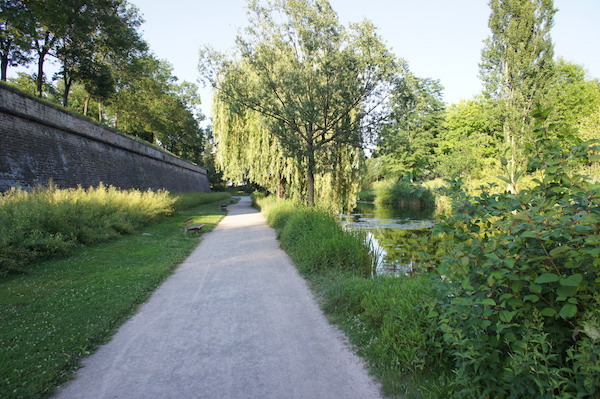 The Parc de l’Orangerie is Strasbourg’s best known park but I’d also recommend a visit to the Parc de la Citadelle. As the picture above shows, it’s a great place for a stroll and has a splash park younger kids are sure to love in the summer. If bikes are more your speed, Strasbourg is the most cycling friendly city I’ve been to in France. It has over 300 miles of bike lanes, thousands of Vélhop bikes for rent, and many times that of bike stands. Indeed, outside of cities in Holland, I don’t know of a city in Europe that has done as good a job of integrating bikes into its urbanscape (kindly send me an email if I’m wrong on this). 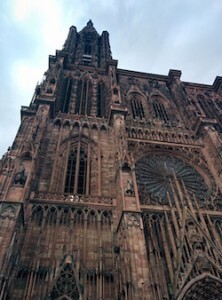 Furthermore, with the Cathédrale Notre-Dame de Strasbourg jutting 466 feet into the sky, even for someone like myself, getting lost is rather difficult to do. Given that I’m directionally challenged, trust me when I say, there are few places I could say that about. Europa-park – 36 miles away. If there is a such thing as a ‘civilized amusement park’ this is it. Reasonable prices, decent food with real tableware, and awesome rides. Mulhouse, France – 71 miles away. Home of a great auto and train museum. 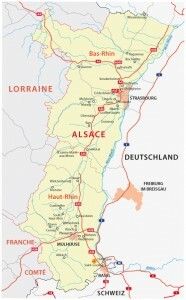 Alsace Wine Route – Extending 100 miles from north to south, Strasbourg places you at the north end of one of the most picturesque and overlooked wine regions in the world. Château du Haut-Kœnigsbourg – 39 miles away. A cool castle with an amazing view. Lake Constance – 120 miles away. Probably better as an overnight but certainly do-able as a day trip. Basel, Switzerland – 85 miles away. Switzerland is beautiful but shockingly expensive. Take a day trip and a picnic to save yourself some money. Freiburg, Germany – 54 miles away. This university town at the foot of the Black Forest is a very easy drive from Strasbourg and with the Triberg waterfall only an hour away you could visit both in a day. A few words about Paris. I love Paris but if you have kids, are on a budget, and are taking your first trip to Europe, unless you live in a big city, I’d recommend experiencing someplace else in France first. Indeed, when I meet people in the U.S. who say that they have had bad travel experiences in Paris, more often than not, they were either on their first trip to Europe or weren’t used to big cities. You don’t have to skip it altogether: With the high speed TGV train running between the two cities, the trip to Paris only takes 2 hours and 17 minutes, making an overnight trip to the City of Light very doable. With this blog already running long I’ll save my Strasbourg food and wine recommendations for next week. Until then, the following recently produced six-minute video does a really great job of capturing the vibe of Strasbourg. Worth a watch.